I was celebrating my 45th birthday when my grandmother Fern said to me, "I am ninety years old, exactly twice your age, and I would like to give you some words of wisdom." Well, I thought about those words for a while and came up with some very distinct feelings about what it is that makes me feel most fulfilled. Weaving had become a very important part of my life — and even more so, using natural materials that inspired what the finished product would become as far as shape, color, design and especially function was concerned. I would dedicate my life full time to this craft that “called” me. My woven pieces have varied functions. Some have utility — like the humble egg baskets from New England. A lot of my objects, such as my wall hangers, come from “doodling”. Doodling helps me visualize form and technique. 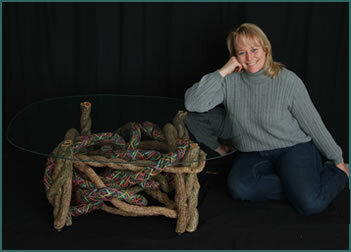 The tables that I design came from an idea that I had many years ago — finding natural elements such as bittersweet to form the base, then weaving the separate pieces together. I had studied set design in college, which was very useful because it had taught me a lot about carpentry and how to construct very solid pieces. Using a piece of beveled plate glass for the top allows the base of the table to be an integral part of the table's visual design. Flowers and landscapes are also products of “doodling." Once again the materials dictate the initial form, which is then incorporated into the finished product. Take for example the petals of a flower which are held together to form a complete shape, or the burst of a sunlit mountain woven in a traditional weave with colors that define the landscape. Weaving is a lot like painting. You can lay down layers of colors and textures to bring forth subtle or vibrant imagery. Most of all I would like to thank my mother for recognizing this need for expressing my artistic spirit by exposing me to this creative craft, and my father for all his endearing support. I enjoy the diversity of the act of weaving, and I look forward to my next "doodle" for inspiration.